In exactly 44 days, my mom will land at Los Angeles Int’l airport. It’s an event the Farklepants’ household is already mentally preparing for, if nothing else, than to cross off the days on our kitchen calendar to see precisely how much more time we have left to bring the cleanliness & organization of our apartment up to military Cecilia’s standards. It’s no easy feat. My mother, bless her heart, is a densely woven tapestry of arduous self-imposed rules & regulations, enforced daily by a deep, unrelenting desire for order & control. Flying by the seat of your pants, which is pretty much the mantra in our house, is something my elderly mom has a hard time coping with. She unwittingly, and with the best of intentions, attempts to smash & stuff our souls into her daily mold of how things ought to be, and at times this collides with the chaotic habits of my free-thinking creative family. She also takes planning and organization to uncharted heights. You know, the kind of heights Martha Stewart can only dream of reaching with her hand-carved & antiquated Scandinavian pinewood ladder. On the other hand, underneath that regimented ice cap of self-imposed order and control, hides the woman that walks into a grocery store in Spain and buys a box of cat food by pointing her index finger into her wide-open gaping mouth and speaking the words ‘meow meow’. The same woman who has mastered the art of overly dramatic Japanese Kabuki-style facial expressions to anything that she finds a) odd, b) inappropriate, c) silly or d) all of the above (*)… It sometimes brings me to the brink of embarrassment, evoking a sheepish smile and a spontaneous “I’m sorry, she’s not from around here” response. (*) Per example, she once addressed an unassuming diner waitress with a Maori battle cry when the poor woman came around to kindly refill her beverage and caught my mother off-guard. You see, Cecilia doesn’t believe in wasting any food or drink (and isn’t that a good Christian virtue?! ), so even though she is full, her own set of imaginary rules mandates that she MUST finish whatever is presented to her. Also… she did NOT want any ice in her drink!!!! This year, since our apartment is at full capacity and my mom fully expects me to lodge her in my house regardless of that fact, I tapped into my professional travel network & award points and was able to conjure free lodging for an epic 7-day road trip through the Southwest USA. It’s an adventure we’re both excited for, if it weren’t for my car having trouble with its right front wheel all of a sudden. We don’t even have enough money to make it through the month at times, let alone that I’m now having to face a dreaded trip to the mechanic, so he can take a look at it and tell me it’ll be $637.41 or so to fix it… Hurray! Let me write you a check. Right. This. Minute. I’m not sure what I’m going to do. I guess God will take care of that predicament in due time. Note to self: have faith. If our financial situation was a person, it would probably be a circus freak. Maybe even the Elephant Man. Or Quasimodo. I picture this is what mom went through as well as a single parent with a delinquent ex-husband. I pretty much spend my entire days worrying in anxiety biting every penny in half, whilst scouring Pinterest in search of hearty rib-sticking meals that cost mere pennies. Our protein-plan exists out of chicken & kielbasa, and the occasional ground beef. We haven’t had ribs or a juicy roast in a good long while, and steak & fish have vanished off of our menu entirely due to their price tag. The thought of Thanksgiving & Christmas dinner currently gives me the willies. Pray that by then, we’ll be blessed by the hand of the forces that may. Mom cooked a lot of ground beef recipes, and I do too. One of my beloved cheap(er) dinners is ‘Cottage Pie’. 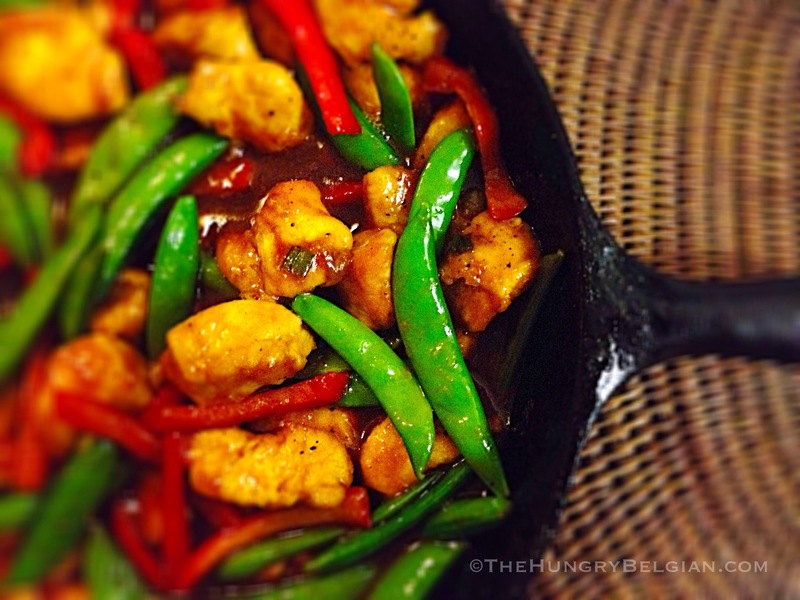 It’s flavorful, hearty and it feeds my family of 3 hungry men + yours truly for pennies on the dollar. To add bulk, I use a gaggle of root vegetables that caramelize slowly, which gives the whole dish another depth of flavor that I find very tasty. The recipe below fills my large 15’ Lodge cast iron pan + a smaller oven dish, and it typically feeds us twice. 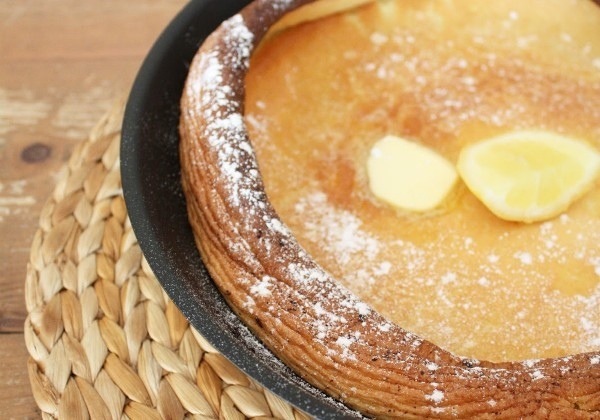 I use a Dutch oven to cook the filling, but you can use any heavy large pan. Start by dicing the vegetables into even dice so they all cook at the more or less the same speed. Mince the garlic and have everything ready to go. Start by heating up your pan over medium-high heat. 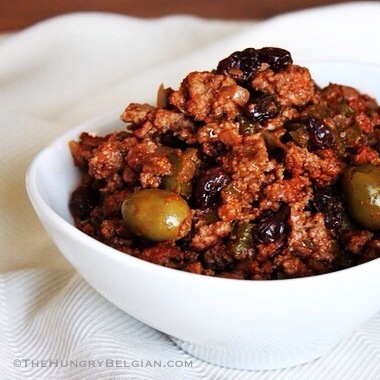 When hot, add the ground beef and a few dashes of browning liquid, and crumble while browning. When it’s all browned, take it out of your pan and set aside. Drain some of the fat, but leave some so we can caramelize the vegetables in it. Turn the heat down to medium-low, add all of your diced vegetables (excl. garlic) and let them slowly caramelize a bit for 30 min or so, stirring regularly to achieve an even browning. When vegetables are browned, add beef back to the pan and turn heat to medium-high. Add tomato paste and brown the tomato paste with the vegetables & beef for 2-3 minutes. Then sprinkle a few tablespoons of flour over the lot, and brown another 1-2 minutes. 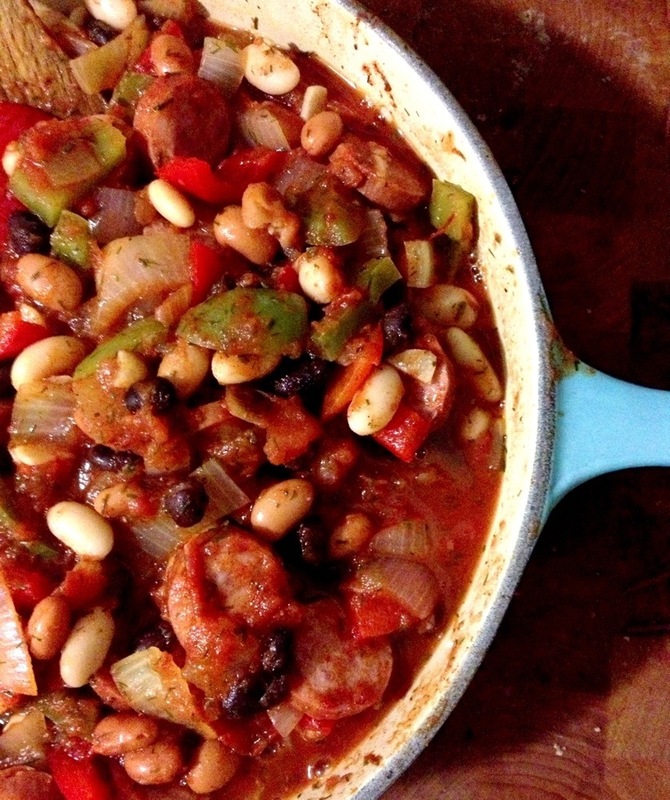 Your pan will be cruddy on the bottom, but don’t worry, this crud adds a ton of flavor! When mixture appears well browned, after 3-4 minutes, add beer and scrape all of the tasty bits off of the bottom of your pan over medium-high heat. Add minced garlic, rosemary & thyme bundle, then add salt & pepper to taste. Turn heat to medium, and let the mixture reduce & thicken for another 20-30 minutes. If too thick, add some water or beef broth. If too thin, keep simmering and I promise it will reduce further. When it’s done, take rosemary/thyme bundle out of the pan and allow the mixture to cool a bit. Peel, cube & boil potatoes until soft. 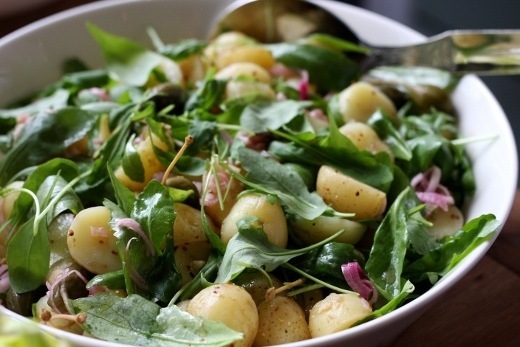 While the potatoes are cooking, warm the milk & butter in the microwave until melted & combined. Add salt & pepper to milk mixture, per your preference. When potatoes are soft, drain them and mash them as usual. They will be lumpy, which is what I like best. Add warmed milk mixture to mashed potatoes a little a time, until you achieve a soft but form mash and the milk mixture is well-incorporated. You may have to use a bit more or less. Add grated cheddar & horseradish (if using), and fold until blended. Your potato mash should be firm and not too soft. Butter or grease your oven dish(es) and spread all of the beef mixture on the bottom(s). Top the beef with the mashed potatoes to fully cover the beef layer. 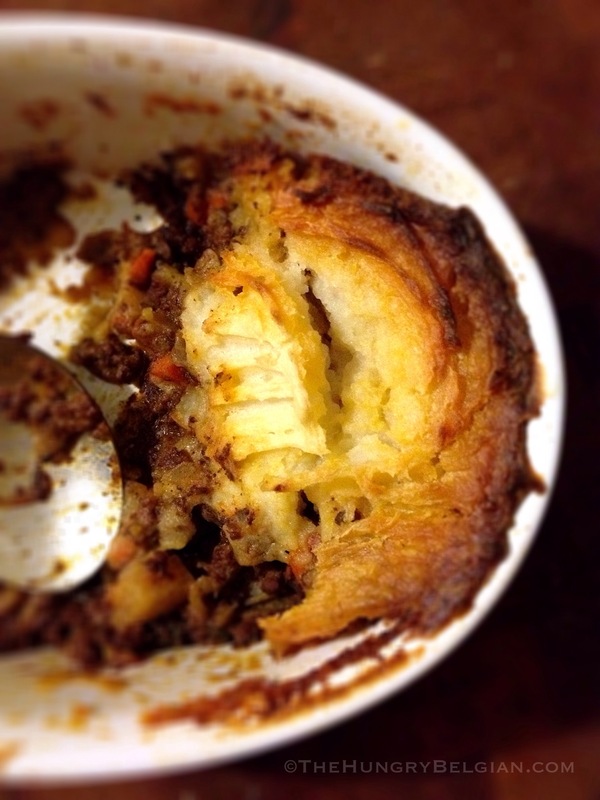 My personal cottage pie math is, is that I like to have 2/3 beef mixture and 1/3 potatoes on top. You can do half/half, it’s whatever you prefer, really. With a fork, make a few lines or crimps in the potato layer, so that when it brow in the oven, you’ll get crispy edges on those ridges. Alternatively, you can also pipe your mashed potatoes on top of the beef mixture ‘duchesse’-style. Bake in a 375F oven for approx. 30-45 min until the edges of the potatoes are well browned. Serve hot, with a pint of Guinness and an Irish joke or two. Oh hey!… I have a blog! I apologize for being a blogging hermit since Jan 2014 lately. I finally stopped working 7 days a week, hallelujah! Technically, this means I have free weekends to devote to my small apartment kitchen and wee blog, however, it so happens to be that these free weekends coincided with the FIFA World Cup of Soccer, et voila… there is no time for blogging when soccer is on, folks! Nowadays, my love for sports mainly manifests itself in eating copious amounts of food whilst cheering on my favorite teams. To aid me in my quest, I spent the past 5+ years transforming my nicely toned triceps into bat wings, so that the flapping motion of my cheering arms deters any flying insect within a 5-foot radius from landing on my chips & dip. As always, I’m at the top of my discipline here. Now that the championship is over and Germany took home the FIFA trophy, I felt it opportune to bake something last Sunday. Anything, really. I work in an office full of Germans, and I swear, baking must be the 11th Commandment in Germany: “Thou must baketh something every week, or elseth thou shalt become Austrian”. Seriously, turning Austrian is every German’s worst fear. I kid you not. But we digress… In a moment of misplaced German patriotism, what with being Belgian and all, I felt the burning need to bake something. Any time I try to bake, I end up with Godzilla from hell. I’m simply not good at baking, but strangely enough, I often feel like baking. I figure that at age 43, I’m probably baking at the level a German 5-yr old pulls off in his/her Fisher Price play kitchen, but whatever. Rome wasn’t built in one day either. And if you too suffer from sub-par baking skills, then these cookies are made for you as well. The recipe calls for exactly 4 ingredients. Four! How can that even go wrong, right? In a bowl and with a handheld electric beater (or in your fancy Kitchenaid mixer), beat the butter and sugar together until pale and fluffy. Add sifted flour a little bit at a time and incorporate it into the butter/sugar mixture with the beater on low speed. Trust me, you want this to be on LOW speed unless you don’t mind flour cakes in your arm pits. When all the flour is well-incorporated, you will end up with a very crumbly mass resembling coarse wet sand. Take a bit of that crumbly dough in your hand, and roll into a ball about the size of a small apricot. Place that little ball on your lined baking sheet, and push your thumb into the center to create a little well or divot. Hence, ‘thumbprint cookies’. 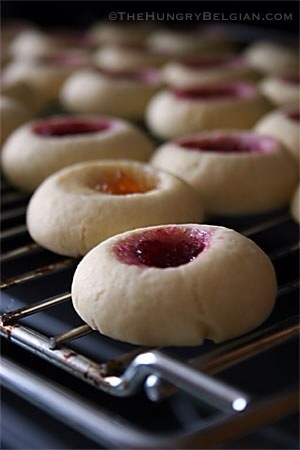 Fill that little divot with your favorite jam, and bake cookies in the center of your oven for approx. 15-20 min until the edges are golden brown. They will be like crack cocaine buttery and crispy. In the late 1990’s, Dennis Mao from Mao Foods brought jidori chicken to America, and mainly to the Los Angeles based restaurant scene. Since then, like any true Hollywood Starlet with plump pink breasts, Jidori chicken’s rise to fame cannot be stopped and nationwide demand far exceeds Mao Foods’ supply… As a matter of fact, unless you are a fancy chef with a Michelin-star restaurant, it’s nearly impossible to buy jidori-style chicken as a regular consumer. So are we cheated from the ultimate deliciousness in poultry? Not entirely. In a fairly recent newspaper interview, Dennis Mao admits that a sustainably raised chicken that is treated humanely in a stress-free environment, fed quality feed and bought directly from a small organic farm, probably tastes as good as his own ‘jidori’-style chicken… and that’s good news for us plain folks. I’m all for eating happy chickens, as horrible as that sounds to some of you. The menu I was typing for my client featured a cider braised Jidori chicken breast. When I hear cider, I think ‘Normandy’ in France. I think warm Camembert ‘en croûte’, green pastures, bovines and delicious apple cider… The recipe below is my own take on authentic Normandy chicken. Give it it a try, oh… and buy happy chicken, y’all! – 4 bone-in, skin-on chicken breasts or 6-8 thighs. Rinse and pat chicken dry. Season on all sides with salt & pepper. Melt 3 Tbsp of butter over medium-high heat, and brown chicken, approx. 3-4 min per side. Sprinkle chicken with flour and allow the flour to melt with the butter so it forms a “roux”. Add Calvados, and ignite to allow alcohol to evaporate quickly. Stand back and be careful! 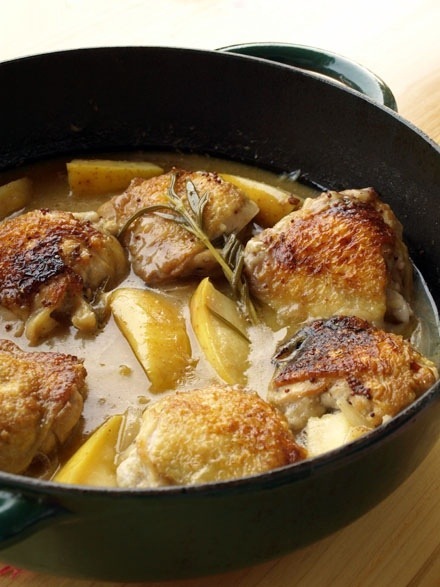 Then add apple cider and rosemary, scrape browned bits off the bottom of the pan and braise chicken without the lid of the pot for approx. 25-30 min. In the meantime, in a separate pan, melt another 2 Tbsp of butter over medium-high heat and brown shallots, mushrooms & apples. When all are browned and caramelized, approx. 10-15 min or so, add all of it (incl. their liquid) to the pot with the chicken, and allow to braise without the lid for another 10-15 min until chicken is tender and cooked all the way through. Finish the sauce with a splash of cream and a sprinkling of finely chopped fresh rosemary, if desired, and serve with crusty French bread or roasted potatoes. Yesterday started off like any other in crock pot land. I placed it lovingly on top of my kitchen counter in preparation of a 10-hour interlude with a delicious Cuban roast pork, until suddenly, at the 67-min mark… it died! To add insult to injury, it didn’t even beep or give any other sign of distress, it just went into full ‘crockiac arrest’. It was but a little over a year old, so I can only surmise that a three pound pork shoulder with 30 cloves of garlic was just… too.. much! Since I can’t afford to replace it right now, its tragic death leaves a void in my family and it leaves behind a plethora of kitchen cabinet friends, such as a humongous roasting pan capable of roasting a whole farm animal and a dainty row of 8 stoneware ramekins, in crisp white, for the more elegant affair. Since I was on a Facebook binge fest enjoying a quiet morning with a cup of coffee, I hadn’t even noticed my crock pot’s ill-fated destiny at first. It was the fact that my living room stopped smelling of citrus- & garlic-infused porky deliciousness, that prompted me to go check the kitchen to see what was going on. My first reaction was a slue of un-Christian and/or inappropriate words, but then that quick wit kicked in and I feverishly pushed all of my slow cooker’s buttons in an attempt to revive it. When my frantic appliance-CPR failed, I created a mess of epic proportion poured everything into my largest Dutch oven and finished braising the pork in the oven. As the pork was cooking, I subsequently spent hours obsessing over what went wrong with my machine, and then ate a handful of milk chocolate chips… for baking… to help me cope with the drama of it all. Shut up. I thought I wasn’t a big fan of pork, but this recipe has me convinced that I am. My beef with pork (see what I did there?) is that it has a tendency to be too dry when roasted, or you have to marinate it overnight and even then it’s like walking a tight-rope with juiciness. I loved that the recipe below doesn’t require elaborate brining or marinating, and it still came out so incredibly tender & moist, that I almost feel like I should apologize for snarfling down a portion that could have fed a small African village for a week. I made my own ‘mojo criollo’ braising marinade, but you could totally use the bottled kind if you find it in your store… and if you want, you can absolute marinate this pork overnight, you just don’t have to. – 3 cups of fresh Valencia orange juice, which is a more tart or somewhat bitter orange. If you can’t find Valencia oranges, use regular oranges and ‘up’ the lime juice to 3 limes. (*) instead of a combination of orange juice, grapefruit juice, lemon & lime juice, you can also use 4.5 cups of bottled ‘bitter orange’ juice or ‘Naranja Agria’. There’s several brands out there, but my store clerk recommended Goya. Combine everything together, and give it a quick blend with a handheld mixer, or blend everything together in a food processor. Slice onions into rings. Place a layer of onion on the bottom of your slow cooker or Dutch oven. Reserve the rest to place on top of the meat. Cut the pork so that it fits into your slow cooker or pot, then stab it all over so the juices can penetrate the meat. Season it all over with the adobo or pork seasoning, and give it a quick sear so all sides are browned. Transfer browned pieces to your slow cooker or a Dutch oven. If you’re cooking this in a slow cooker, turn your machine on ‘low’ and cook for 10 hours. If you’re cooking this in your oven, preheat your oven to 325F and cook the meat in a lidded Dutch oven for approx. 4 hours. When the meat is fork-tender, take it out of the braising liquid and pull it just a bit into a large bite-size chunks. Reserve some of the braising liquid. 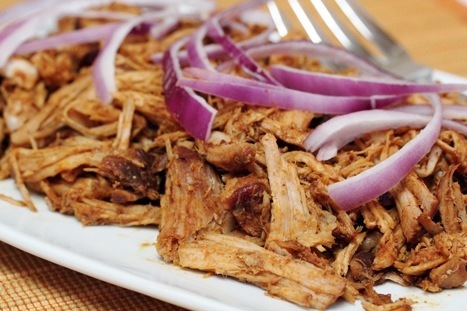 You can eat it ‘as is’, but for more Cuban tastiness, add the pulled pork to a buttered baking sheet and pour about 1/2 cup of the reserved braising liquid over it. Roast in a 350F oven for about 30 min… or give it a quick sear in a cast iron skillet! I consider myself to be a resourceful person. My ‘creative thinking’ ability was evidenced at a young age, when I once received a homework assignment from my strict Catholic school, with the instruction to listen to the Pope’s Easter mass & speech and fill out a 100 item questionnaire about it. Faced with the horror of having to sit through 4 hours of televised prayer in Latin – on Sunday no less! – I told my teacher that our TV was of a communist brand and that therefore we weren’t able to tune into the channel in question as our airwaves were censored by the Russian Orthodox Government. I think I should have gotten an honorable mentioning for such creativity, but instead I got to copy the “Ten Commandments”… 25 times! I entirely blame my mother for this kind of quick-witted creative thinking. After all, she was a pro at it herself and she was known to smite the nonsensical ways of the strict Catholic establishment on a routine basis. As an example, when she was hired by the private convent school in question, the bearded dragon head nun made it clear to her that she was expected to wear a long, calf-length skirt & stockings, and to refrain from engaging the girls in any scandalous or improper activity such as, but not limited to: cartwheels, splits, summersaults, exercises that required us to spread our legs, headstands or anything else that could potentially expose the Lord to juvenile indecency. Since it proved futile to reason with the clergy about the scholastic curriculum of a physical education class, my mother creatively taunted the school’s ridiculous policy and showed up for her first day on the job wearing a long skirt… with a snazzy pair of shiny red metallic Adidas sweatpants underneath! Creativity and independent thinking ranked high on our mother’s list of virtues she deemed necessary in life. She made sure our little brains were exercised daily, and she made it a point to teach us to think outside the box and to never accept nonsense as suitable answer or solution. I’ve had to be creative with our food budget on many occasions, but when I came home to a virtually empty fridge yesterday, it gave culinary creativity a whole new meaning. With payday still 3 days away, I took a quick gander in our pantry and figured I could manipulate a recipe for Polish sausage & beans I saw on Pinterest a little while ago. The result was a hearty & flavorful stew of tomatoes, peppers and kielbasa, and it received two thumbs up from all of us. 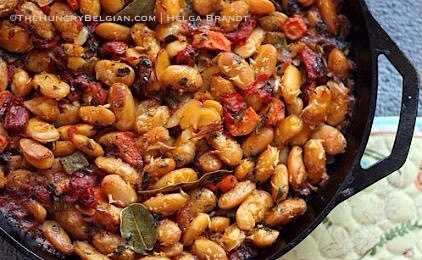 (*) You can use any beans you like, but I prefer a combination of white cannellini beans, black beans & pinto beans. Drain and rinse beans under cold water, set aside. Chop peppers and onions into large dice. Crush garlic with the back of your knife, and chop into fine pieces. Slice kielbasa into small rounds. Heat olive oil in a heavy pot, and sauté peppers, onions and garlic until beginning to soften. Add crushed tomatoes, paprika, dill, parsley, salt & pepper, and simmer until vegetables are soft. Add kielbasa and beans, and allow to simmer until everything is warmed through. Serve over brown rice or with a crusty loaf of bread.